SENSUALITY 1: PAIN AND PLEASURE “They have become callous and have given themselves up to sensuality, greedy to practice every kind of impurity.” Ephesians 4:19 Women body are beautiful and commonly been used on western medias to sell any product; partially clothed or with no clothes at all and in Middle East women are forbidden to show too much of their body in public. Ironically Belly dance, which is a form of an entertainment for men in the Middle East with women partially dressed dance erotically for men’s pleasure. Sexual abuses against women are even more common in the Middle East than in the West. In recent years, news about sexual abuse against women was so common. From the western world to the Far East, women have been subjected to horrific sexual abuse. Men of depraved minds from all classes from Presidents to law makers, rich and poor have been accused of indulging in molestation of women. This is what influenced this painting – SENSUALITY1. 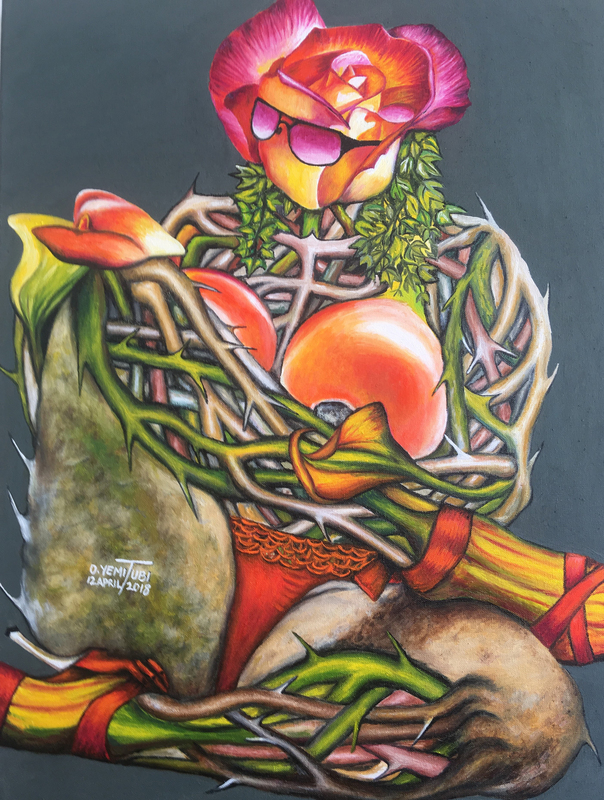 O. Yemi uses Roses and thorns to illustrate pain and pleasure of sensuality in which rose is for pleasure and thorns are the pains of sexual abuse. O. Yemi uses Rose for head and rose bulbs for the breasts of the figure. Steams of thorns are creatively woven together to form the figure of a woman seated wearing red-laced under pant and red high-hilled shoes.